Visit the Scottish Highlands. Free from Feb 15-Feb 20. If you read, review! Llewellyn, the wanderer gets entangled with a peasant girl named Branwyn, and he decides to keep her, whether she likes it or not. He knows and she knows that she likes him more than she’s saying. But they both walk very carefully. He’s got dangerous state secrets. He IS a dangerous state secret. And she has secrets even she doesn’t know. EARTHCHILD is a battle-of-wills romance brimming with adventure, secrets, passions, and a love to conquer all. Born of royal blood, but on the wrong side of the blanket, Richard Llewellyn walks a blurred path between the stigma of bastardy and nobility of lineage. We first meet him as a spy investigating rumors of rebellion in Lord Gordon’s estate in the Highlands. 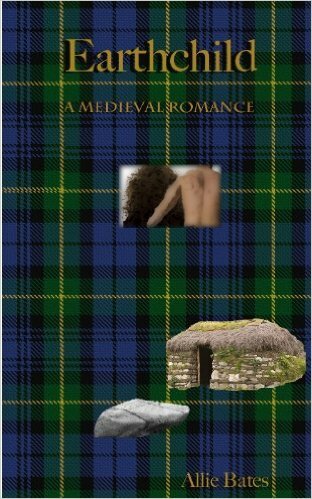 When he encounters a Highland beauty, Branwyn he is enchanted, perhaps bewitched, and swears to possess her at all costs–never dreaming that the cost may be higher than he thinks. The object of his desire has the sight. She reads runes, talents that ran in her mother’s family. (See A Wee Light) She believes herself to be a peasant, alone in the world except for one good friend, Brian, who has disappeared. When she is forced to marry the mysterious Llewellyn, she is angered and frightened by turns. Is it the man who causes her distress… or the desire he ignites within her? By day Llewellyn scouts; by night he seduces Branwyn, determined to win her body, and her heart. Branwyn feels the pull of his power, but still she resists–for she has glimpsed the future and the dangers it holds for them both.